Dalton – THE AWESOME is a distance game with platforming elements and insane powerups. Run through cities as a horde of zombies give chase. Use your guns and enhancement powers to plow through and go the distance. Released by Colorbox, you can buy Dalton – THE AWESOME for $0.99 on the iPhone, iPod touch, and iPad. So how awesome is Dalton – THE AWESOME? Do the capital letters really represent the level of awesome this app contains!? The gameplay boils down to jumping over gaps and zombies, keeping your distance from the massive cluster of the undead behind you, and using powerups. The entire game is played with a single button press. Tap your finger anywhere on the screen to jump. That’s pretty much all you have to do. The different powerups are usually just a way for you to easily roll over road obstacles like oil slicks or spikes or auto zombie kills. This one touch control works very well to keep the pace up and it lets you focus purely on incoming hazards. Graphically, this is an excellent use of the “Doodle” art style. Paper cut outs of varying art styles for places like the United States, China, Egypt or Italy, and others. Your main character, who I assume is named “Dalton,” and all the zombies are in the Xiao Xiao stick-figure style. The art style fits together quite well and the powerups are well designed. So gameplay is really good. You have a swarm of zombies chasing you the entire time. They run faster than you so they can catch up pretty quickly. Each time you jump across a large gap or upwards to a higher platform, they will all fall right off the edge and die, giving you temporary breathing space before the next swarm shows up. Imagine this game as 28 Days/Weeks Later with a lighter tone and atmosphere. 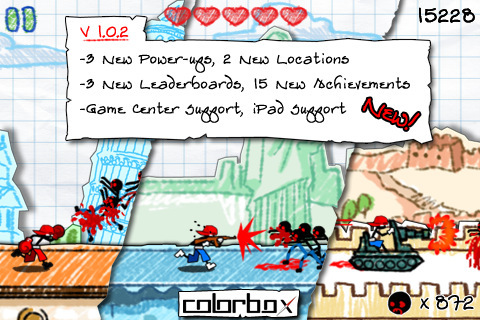 Once you gain the special powerups, the gameplay changes for a few seconds. Become superman with a jetpack and fly right over your enemies. Equip a motorbike and Evel Knievel your way through enemies. Eat a mushroom and grow 10x your normal size to easily step over smaller gaps and crush the enemy under your feet. The potential is very well done and balances the feeling of repetition. Dalton – THE AWESOME is surprisingly fun and the art is quite good. I really do enjoy the implied theme of running all over the world trying to get away from the Rage Zombies that are constantly finding you. You use super powers, ride vehicles, and shoot at them but they will never stop chasing across the roofs of dozens of countries. Now that’s dedication! I highly recommend this to platform/distance game lovers. Give the Awesome a try. It’s really entertaining even as a quick 5 minute time killer. Man, I’ve been playing quite a few great iPhone games lately. I hope this streak lasts for a while! 5-Star games are hard to find and this streak is rare. AWESOME! AppSafari review of Dalton – THE AWESOME! 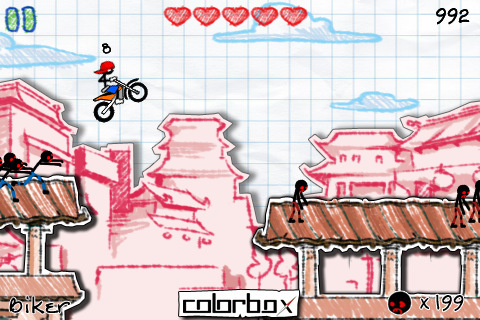 was written by Joseph Ho on March 17th, 2011 and categorized under Action, App Store, Featured, Fun, Games, Platformer. Page viewed 7203 times, 1 so far today. Need help on using these apps? Please read the Help Page.